The King of Muay Thai cares not for victory or defeat; he merely wishes to clash against fighters of great strength. His chest bears the scar left by Ryu's Shoryuken, and serves as a reminder of their fight. 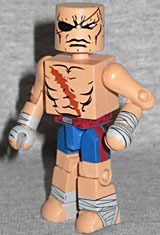 It's kind of crazy that we only got a Sagat Minimate thanks to this Street Fighter x Tekken line. Was he not in Marvel vs. Capcom? Weird. And he's a TRU exclusive, to boot! He looks really nice here, with his eyepatch, his scowl, and the giant ugly scar on his chest. The wraps onhis hands and feet are detailed well, too, but only on the front/outsides. Since Sagat's always shown as being ridiculously tall next to the other Street Fighters, it's a shame that this Minimate didn't get some kind of height boosting pieces, like Giant Man. Maybe they would have been too hard to hide ona man wearing nothing other than a pair of trunks? 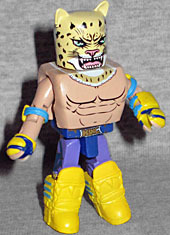 A pro wrestler who wears a jaguar mask to the ring, King swore revenge against his mentor Armor King's foe, Marduk, but they eventually reconciled. He is a silent and serious fighter. Wait, the dude in Tekken with a cheetah head does not really have a cheetah head? It's just an amazingly lifelike mask? I feel cheated! Next you'll tell me the boxing kangaroo isn't really a kangaroo. Side note: ART ASYLUM, WHY DID YOU NOT MAKE THE KANGAROO!? Gah! King has a "powerhouse" chest cap, a waist cap with a tail hanging off the back, and new boots, elbow pads and gloves. His head looks like a jaguar mask, of course, and you can remove it to reveal the man beneath! Just kidding: the head under there is blank.